Direction : Study the following bar chart carefully and answer the questions given beside. 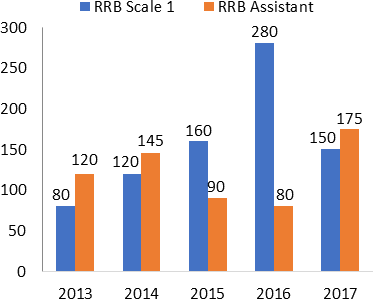 The bar chart given below shows the number of students who cleared the two examinations, RRB Scale 1 and RRB Assistant over the years per every 1000 students who appeared in these exams. If the total numbers of students appeared in RRB Scale I in 2016 was 2.5 lakhs then how many of them had cleared the RRB Scale I examination in 2016? The number of students who cleared RRB Scale I examination in 2015 is approximately what percent more than the number of students who cleared RRB assistant examination in that year? Since we don’t know how many students applied for RRB Scale I examination in 2015 of RRB assistant examination in that year so it is not possible to find the required percentage. The total number of students who applied in 2017 was 7.5 lakhs and the respective ratio of the number of students who applied RRB Scale I and RRB assistant 7 : 8 then find the respective ratio of the number of students who cleared RRB Scale I examination in 2017 and the number of students who cleared RRB assistant examination 2017? In this article we will discuss What is Data Interpretation, How its important for Bank PO and Clerk Exams. In this article we will discuss What is Data Interpretation, How its important for Bank PO Pre Exams. In our day-to-day life, data is reported in the newspapers, on television, and in magazines. The data involves business, government, sports and many other topics. It is represented in an organized fashion, making it easy to interpret what you hear and read in the media. Those set of problems is being asked in different kind of form like Pie Chart di, Bar Chart di, Table Chart di, line chart di and info chart etc. Now come back to the point data interpretation, Data has to be well organized for it to be useful. This process of interpreting and analysing data to extract meaningful information from it is Data Interpretation. Solving Data Interpretation problems involves the use of basic formulas and manipulation of numbers. Data Interpretation is calculation-intensive. It consists of a myriad of graphs, charts and tables form which you have to glean and analyse data. The key to cracking this area is to quickly identify the key pieces of data that you require to work on the questions asked. Problems in Data interpretation are probably the closest in resemblance to the kind of problems you will be dealing with as a manager. They test your decision-making ability and speed using the minimum possible data. They help you to draw conclusions from collected data, support decision making, and contribute to better process, product, and quality models. Data Sufficiency problems involve testing your quantitative concepts. They usually take the form of a logical puzzle. Instead of solving a data sufficiency problem, all you need to do is determine if the given information is enough to solve the problem. To solve Data Interpretation Questions & Answers for Banking and Insurance Exams like SBI, IBPS, NABARD & RBI Grade B, NIACL, and LIC, you need to brush up your calculation skills; you need to perform calculations faster and accurately than others. The difficult Data interpretations should be solved within 10-12 minutes. The DI of moderate level should not consume more than 7-9 minutes of the time and easy DI's should be finished within 3.5-4 minutes. In these Data Interpretation Quizzes, you familiarized yourself with the key concepts and improved your problem-solving abilities. At Smartkeeda you will get Easy level data interpretation to High level data interpretation at low cost. Practice and tests are important to optimize your preparation. First take the quizzes regarding your exams and take full mock test at Testzone to improve your problem-solving skills. Questions that have appeared in the previous IBPS PO exams are also a part of these quizzes. Go through them you can understand where the focus lies in an examination environment. The detailed solutions of the questions may provide some alternate strategies that can help you improve your speed and accuracy. At Smartkeeda you can attempt High Level Data Interpretation quizzes and download (DI) PDF for free.